The first week focused on the new global standard on Automatic Exchange of Information. This was the 8th seminar in a series being held across the globe, and was attended by delegates from Colombia, Argentina, Chile, Mexico, Peru, Turks and Caicos Islands and Uruguay, many of which are implementing the AEOI Standard with first exchanges occurring in 2017. Expert presentations were shared by CIAT, Spain, Italy and representatives from the OECD Business and Industry Advisory Committee. The workshop was designed to assist government officials in implementing the AEOI Standard. The topics covered included technical concepts in the AEOI Standard, key policy decisions, approaches to legislation, confidentiality considerations and information technology aspects of the new standard. Participants worked on developing implementation plans during the workshop, which could form the basis for implementing the AEOI Standard in their home jurisdictions. The second week was a "Last Mile" seminar, designed to support tax auditors effectively use the tool of exchange of information on request. Now that the international standard has been successfully implemented in many jurisdictions around the world, it is critical that tax officials are also equipped to make use of the EOI highway for improving tax compliance at home. The course raised awareness of the key aspects of the international standard, shared success stories from tax administrations in the region, and case studies were discussed and resolved by the participants. The aim is to foster a "culture of information sharing" among officials engaged in tax control. 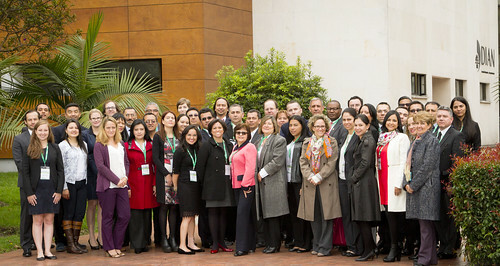 The seminar involved instructors from the Global Forum, Colombia and CIAT, as well as valuable contributions from World Bank Group officials and representatives of tax administrations from of a group of Latin America and the Caribbean countries: Chile, Colombia Costa Rica, Mexico, Peru, and Turks & Caicos Islands. The Last Mile course has been held in many Global Forum member jurisdictions, including Cameroon, Ghana and Kenya in the last two months. The Global Forum is devoting a lot of effort to assist its members implement the new standards on exchange of information for tax purposes. For more details, see our Technical Assistance page.